We’d love your help. 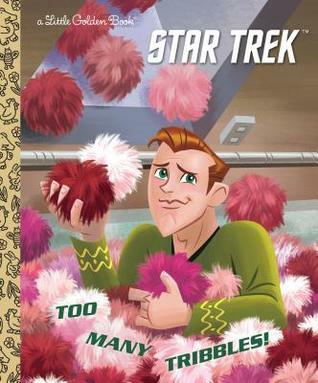 Let us know what’s wrong with this preview of Too Many Tribbles! by Frank Berrios. Captain Kirk and the crew of the starship Enterprise come face to face with adorably fuzzy Tribbles in this exciting and fun-filled Star Trek(TM) Little Golden Book! Captain Kirk and the crew of the starship Enterprise are ready for almost anything--except tribbles! When these small, furry creatures invade the ship, Captain Kirk and the crew must act quickly, before they ar Captain Kirk and the crew of the starship Enterprise come face to face with adorably fuzzy Tribbles in this exciting and fun-filled Star Trek(TM) Little Golden Book! To ask other readers questions about Too Many Tribbles!, please sign up. Be the first to ask a question about Too Many Tribbles! Trivia About Too Many Tribbles!